Are Reverse Mortgages Experiencing a Sea Change? For reverse mortgages, often the phrase has come to mind: The only true constant is change itself. For the last four years, the industry has seen change after change after change. But I wonder if, for the first time in the long time, that phenomenon itself is changing. The year 2011, my first covering the industry, brought the exit of large banks from the originations landscape. In 2012, the HECM Saver came into focus and lenders looked to different product types to grow business alongside an ongoing game of originator musical chairs. Then in 2013, the fixed standard product went away, and principal limit factor changes took place. In 2014, the product changed again to reduce the amount of proceeds borrowers could take upfront. Finally, 2015 brought the reverse mortgage financial assessment and non-borrowing spouse protections took effect. It’s an over-simplified timeline, but the point is that change has been constant, proving that phrase to be true in the reverse mortgage conversation. But for the coming year, the sound of change seems further off. At the inaugural ReverseVision conference last week in San Diego, the conversation was different, but more positive… for a change. 1. First, the home equity conversion mortgage has changed a lot, but for the first time, there aren’t a lot of concerns around it. Non-borrowing spouses are protected, and last-resort borrowers are no longer the norm. Instead of voicing concerns about borrower qualifications and loan troubles, attendees took an interest during the conference in some of ReverseVision’s new products and developments, such as a CRM-like add-on to its existing origination platform that will help originators keep track of their prospective clients. RVAccelerator, the new offering, considers reverse-specific information such as contact information for adult children and financial planners, and different loan scenarios. It’s not a CRM, but it does bring leads and loans into the same system. With a safer product, originators can begin to focus on sales without having an uphill battle. Which brings me to my second point. 2. The media and messaging around reverse mortgages has changed. 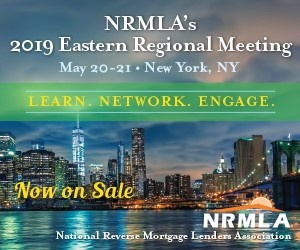 Also during the conference, NRMLA’s head of public relations Jenny Werwa shared with attendees some of the work the association has been doing around public perception—and the news is good. Jenny cited her recent media audit of the last six months or so, finding that 96% of media coverages on reverse mortgages has been positive or neutral. With fewer product changes and organizations that are unhappy about the product’s shortcomings, there’s much less media attention on the negatives. Frankly, there really aren’t many negatives to highlight anymore. 3. And finally, the conversation is changing when it comes to the use of reverse mortgages. We’ve been writing for years about financial planners as a possible referral source, and while most agree that educating financial planners is not easy, it actually is getting easier. That’s because one by one, influencers in the financial planning world are studying the benefits of reverse mortgages, and they’re finding, unanimously, they are a good idea. ReverseVision President John Button led several sessions during the conference, one of which focused entirely on work with financial planners and discussion points to highlight when working with them. The event’s keynote speaker, Jamie Hopkins, Co-Director of the New York Life Center for Retirement Income at The American College spoke about his own research on reverse mortgages. The research is undeniable, it just needs a little time to gain traction. And originators are actually being helped for the first time, by several renowned thought leaders in the financial planning world. By definition, a sea change represents a long change over time. It’s a long road ahead, of course, but the road seems to be headed in the right direction.